The IAM is calling for the government to pilot an 80mph speed limit on a controlled and managed motorway to assess its practicality and safety, and road users’ reaction to it. In September former Minister of State for Transport the Rt Hon Philip Hammondannounced that the motorway speed limit could be raised to 80mph. On uncongested motorways more than half of car drivers exceed the 70mph speed limit, and around a fifth exceed 80 mph*; it is rare for the police to prosecute drivers travelling between 70 and 80mph*1. Road safety groups have raised a concern that legalising today’s tolerated, yet unofficial, 80 mph speed limit would simply create an unofficial 90 mph limit. If this happened average traffic speeds would increase, as would accidents and their severity – more people could be killed and seriously injured. The IAM highlights the need for a full risk assessment of an increase in the speed limit, and believes strict enforcement is required to ensure greater compliance with the limit. For example driving at 82mph should risk a speeding ticket. The IAM wants to see 80mph trialled initially on “Controlled Motorways” and “Managed Motorways” where variable speed limit technology is used. 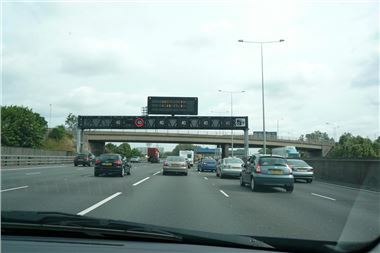 These have already been implemented successfully on the M25 orbital motorway in Surrey and the M42 in the West Midlands. are shown to increase significantly, of course a better-enforced 70 limit may be a more appropriate system. not be appropriate to issue a fixed penalty notice but to issue a summons instead. Note: These are guidelines and that a police officer has discretion to act outside of them providing he acts fairly, consistently and proportionately. 70 mph speed limit ACPO charging threshold (Fixed Penalty) 79 mph; Summons 96 mph." The IAM is the UK’s largest independent road safety charity, dedicated to improving standards and safety in driving, motorcycling and cycling. The commercial division of the IAM operates through its occupational driver training company IAM Drive &amp; Survive. The IAM has more than 200 local volunteer groups and over 100,000 members in the UK and Ireland. It is best known for the advanced driving test and the advanced driving, motorcycling and cycling courses. Its policy and research division offers advice and expertise on road safety.